Dr. Joe Takehara, D.D.S., a second generation Japanese American, has trained with the legends of aikido during his fifty-three years of studying the Japanese martial art. Meanwhile, he was a married father of three and built a successful dental practice from which he retired at the age of eighty. Despite being the most senior aikido practitioner in the Midwestern United States, his fifty-three year journey has gone relatively unrecorded. 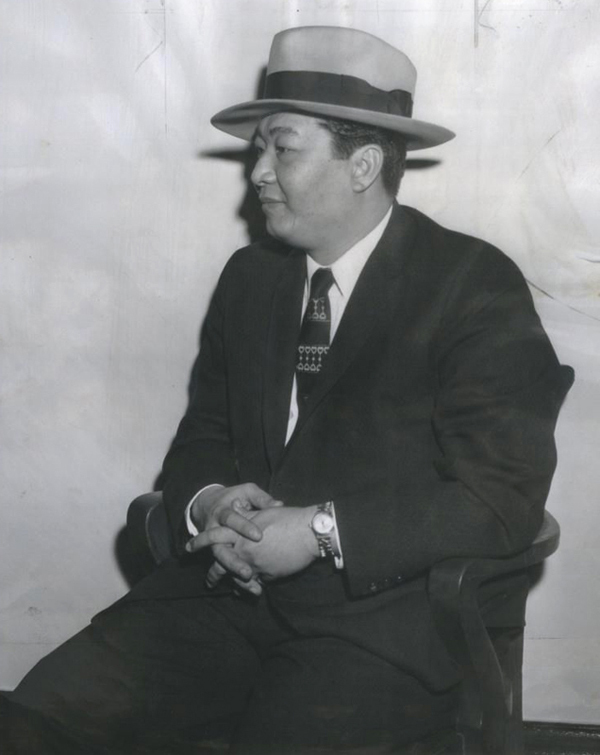 Joe Takehara at his home on Chicago’s North Side. Photo courtesy of the author. Aikido, a modern Japanese martial art developed by Morihei Ueshiba (1883-1969) in the early twentieth century, boasts over a million practitioners worldwide. At eighty-three years of age and having practiced since 1961, Joe Takehara is the most senior devotee of this tradition in the Midwestern United States. Born the youngest of eight children in San Diego, California, to immigrant parents from Wakayama Prefecture, Japan, Joe Takehara grew up in a barrack on the grounds of a fish cannery adjacent to Lindbergh Field (today’s San Diego International Airport). Never having known his father, who was hit by a car and killed when Joe was three years old, he and his siblings largely fended for themselves as their mother worked long days at the cannery. In 1942, following the attack on Pearl Harbor, Executive Order 9066 uprooted the Takehara family to Poston War Relocation Center in southwestern Arizona, one of ten World War II concentration camps built by the War Relocation Authority to incarcerate some 120,000 persons of Japanese ancestry from the West Coast. When internment ended in 1945, the Takehara family migrated east, following a wave of some 20,000 Japanese American resettlers from various camps to Chicago. Joe was fourteen years old. “I was small. I only weighed eighty pounds when I went into high school. And we lived on the West Side, 901 South Marshfield—there were no Japanese in our neighborhood. Most Japanese coming out of camp settled on the North or South Sides. “So my first day of high school I’m getting picked on in gym class and the coach, I still remember his name, Coach Ellis, says to me and the other guy, ‘Put the gloves on.’ Well, in camp there was a guy named Terry Tsuchiyama who taught me how to box, and if you know just enough to be able to handle yourself a little bit, it’s no contest in a fight against someone who doesn’t know how to box at all. And this kid didn’t know how to fight, so I got the better of him. 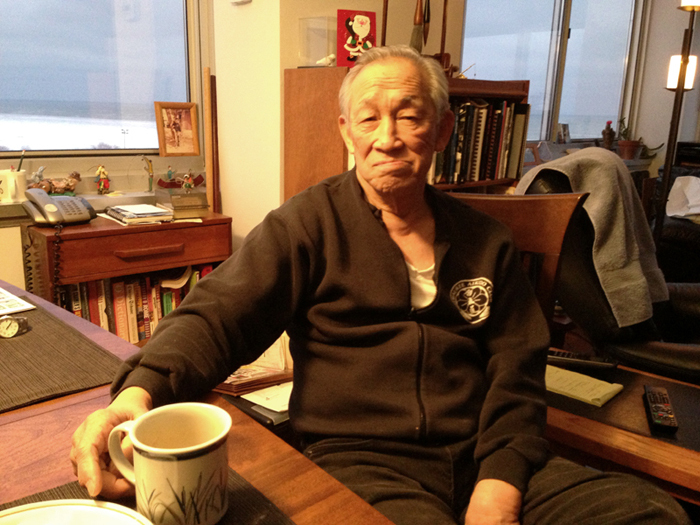 Through a variety of circumstances, Takehara later transferred to Lakeview High School on Chicago’s North Side, where he graduated in 1949. He continued on to University of Illinois at Navy Pier and then University of Illinois Dental School, where he earned his D.D.S. In 1961, shortly after beginning a dental practice at 3355 North Clark Street in a North Side Chicago neighborhood populated by Japanese Americans, he was approached by John Omori, an optometrist whose office was down the street, to join a newly formed aikido group. It was located in the basement of Chicago Police detective Tony Muranaka’s three-flat, across the street from Joe’s office. A grappling system derived from classical schools of jujutsu, in the early 1900s Ueshiba synthesized his various studies of ancient Japanese martial arts and religion to form a modern method of physical and spiritual culture. Koichi Tohei, a senior student of aikido founder Morihei Ueshiba and later Chief Instructor of Aikido World Headquarters in Tokyo, first introduced the art to the United States via Hawaii in 1953. On the mainland, it was introduced to the Japanese American community of Los Angeles in 1956, making its way to the Midwest five years later. Detective Anthony "Tony" Muranaka, whose Clark Street home provided the first practice space for the Illinois Aikido Club, was the first Nisei to serve on the Chicago police force. 1959 press photo by Ralph Arvidson, courtesy of the author. “I went and trained with them about the second week after they started, so I’m a charter member but not an original first member. I came with this guy Red Sakamoto, a guy that stayed with us a long time, he was from Hawaii. We were there the same day. A lot of these guys were Hawaiian because Miyagi and Muranaka were from Hawaii. Most of the early members were Nisei (second generation Japanese American) professionals interested in a cultural pastime with mental, as well as physical, benefits. 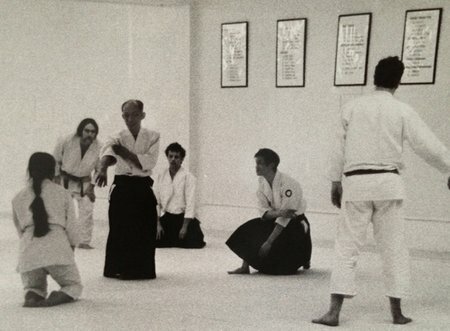 They called their dojo the Illinois Aikido Club and would eventually host such notable instructors as Chester Sasaki, Francis Takahashi, Motokage Kawamukai, Isao Takahashi, Yoshihiko Hirata, Akira Tohei, and Shigeru Suzuki. Initially, the group learned from a book written by the aforementioned Koichi Tohei. Shortly thereafter, a young man from Hawaii by the name of Chester Sasaki, an undergraduate at the University of Illinois at Urbana-Champaign, began making the three hour commute to Chicago on weekends to instruct. L-R: Saburo “Sab” Tanaka, Joe Takehara, and Koichi Tohei (visiting from Japan) at the Illinois Aikido Club’s storefront location on Clark Street. Photo courtesy of Joe Takehara. “Chester would come down on weekends and teach us. He was a nidan (second degree black belt) from Hawaii. We heard of him through the grapevine, because so many of our people were from Hawaii. He was young and didn’t know any better…he used to hurt us (laughs)! A short time later, they rented a street-level storefront on the next block at 3223 North Clark Street. At this location they had a student who worked for a foam company and, through him, were able to procure material from which to jury-rig their first mats. Meanwhile, Takehara was busy building his family and dental practice. “They were practicing almost every night. I was never a great student. Let’s put it this way, I had a dental practice and I worked nights. So I only worked out on maybe Sunday mornings. I used to go Tuesdays sometimes, and on Fridays. Later on I started teaching beginners on Tuesday evenings, to help Red Sakamoto. And then I used to train Fridays in the later part of my life. 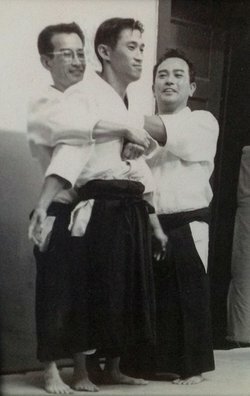 Despite the “hard knocks” he experienced as a youth, Takehara never mentioned self-defense as a motivating factor in his aikido training. “I grew up streetwise. I used to carry a roll of pennies in my fist and a switchblade, walk in the middle of the street at night on the way home from school, never on the sidewalk, and if someone came out from the gangways, I ran! 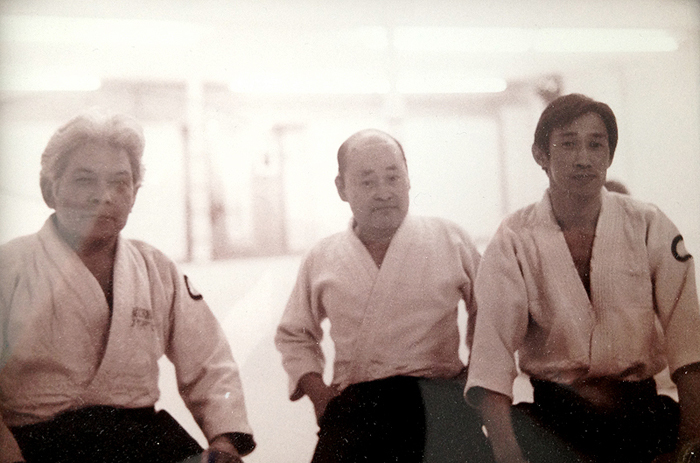 L-R: Norman Miyagi, Robert “Red” Sakamoto, Joe Takehara. Photo courtesy of Joe Takehara. In spite of self-proclaimed declarations that he was never the committed student his classmates were, Takehara is currently ranked rokudan (6th degree black belt) by the Aikikai Foundation (Aikido World Headquarters, Tokyo) and although not the highest ranked, remains—largely unrecognized—the most senior aikido practitioner in the Midwest. Nevertheless, he humbly reflects on his beginnings and remains thankful for the direction his life has taken with respect to many of his early peers who ended up less fortunate. Joe Takehara (on one knee, center) watches as Kisshomaru Ueshiba, second headmaster of aikido, instructs during a visit to the Illinois Aikido Club in the 1970s. Photo courtesy of Joe Takehara. Joe Takehara continues to teach at the Chicago Aikido Club (an offshoot of the original Illinois Aikido Club), located at Tohkon Judo Academy within the Japanese American Service Committee building on Clark Street, ten blocks north of Tony Muranaka’s marble-floored basement. Fifty-three years later, new students are greeted with spring-loaded mats.